Printing has become more complex, and more competitive than ever. 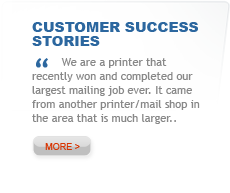 Customer expectations are challenging the most sophisticated print service providers with demands for faster turnaround and more online services. Profit margins are being squeezed ever tighter and the days of allowable waste are gone. PressWise addresses these challenges from the ground up with a single browser-based print MIS and workflow automation system that handles all your shop’s orders, including the online business, custom walk-ins or email jobs that other systems fail to manage. You no longer have to spend $50k – $100k on a workflow solution or cobble together products from different manufacturers, only to face additional cost burdens to integrate and maintain them. 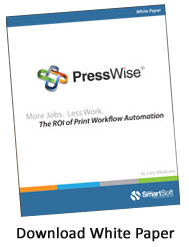 PressWise was designed as an alternative to purchasing independent modules (or custom development) of Web-to-Print, Print Production Workflow Management, Print MIS, and Mail Preparation Software. Now a single end-to-end system is available with the comprehensive tools needed to streamline your business. Implementation is fast and easy. The system is accessed through a browser and can be used in just a few hours of setup and online training. PressWise is available cloud-hosted or self-hosted in your own shop (Win/Mac/Linux). Either way you get the convenience and productivity of a scalable, modern, browser-based service. Both editions are offered via a Software-as-a-Service (SaaS) business model with NO long-term contracts. We help you succeed, or we don't retain your business. PressWise lets you handle more orders with fewer touch points, improving your productivity and maximizing your ROI. More Jobs. Less Work. Sound good? PressWise is helping our clients grow their business and it can do the same for you - let us show you how! To find out more about the dramatic and immediate impact PressWise can have on your business, take a look at our series of White Papers. They include examples of very different print service providers who have generously shared their real-world results to demonstrate how transitioning to a fully integrated, software-as-a-service (SaaS) order-to-invoice workflow can deliver fast ROI and boost productivity and margins. Take a look at our PressWise Features page to get an overview of some of the great tools PressWise puts at your disposal, or visit www.PressWise.com for more detailed information.